Ever wondered how much you save each month by using Kuna Library? 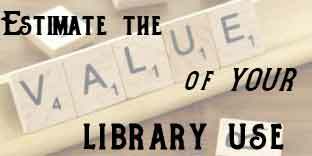 Then click on the image above to use our Library Value Calculator and find out! Kuna Library District is embracing the growth in our community. Please click on the image above to learn how we'd like to grow with our community. 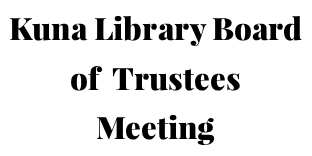 The monthly general meeting of the Kuna Library Board of Trustees is Tuesday, April 16, 2019 at 5 pm in the Flo Hawkes Trustee Conference Room. General meetings are open to the public and all interested persons are invited to attend. The annual Friends of Kuna Library spring book sale is May 2-4. Volunteers are needed to help with set up, book sorting, cashiering and tear down. Sign up to help online by clicking on the image above. Renew items you have checked out. Reserve items you'd like to borrow, or search our catalog. Kuna Library card required for some features. Kuna Library now has mobile hotspots available for checkout! Click on the image above to find out all the details. We now offer a wide selection of video games available for checkout at Kuna Library! Request an item for the Kuna Library collection by filling out the online form. Find the form by clicking on the image above. Please remember that not all requested material may be purchased, however all requests will be considered. Pronunciator offers a fun and FREE way to learn any of 98 languages. Pronunciator can be used on your desktop computer or on a mobile device. Zip code and city required for login. Check out the online courses available for FREE to Kuna Library card holders through Lynda.com. Kuna Library card number and PIN required for login. Find independent reviews, age ratings, & other information on all types of media.